Embark on the ultimate sightseeing holiday with all your favorite Disney characters in Disney On Ice presents Passport to Adventure. Join Mickey, Minnie, Donald, Goofy and Daisy on a journey to the magical worlds of Disney’s The Lion King, The Little Mermaid, Peter Pan and Lilo & Stitch. You’ll explore the Pride Lands with Simba, Timon and Pumbaa; voyage under the sea with Ariel and all her aquatic friends; tour London with Peter Pan and Wendy, before flying to Never Land; and travel to Hawaii to visit Lilo and Stitch. Upbeat music, loveable characters and exciting destinations make Disney On Ice presents Passport to Adventure a holiday you’ll never forget. 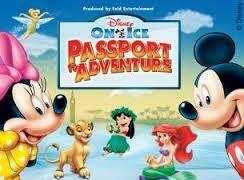 Disney on Ice presents Passport to Adventure is coming to St. Paul, MN on December 12th to December 15th at the Xcel Energy Center. Opening Night tickets are only $12! No code needed! Get Your tickets Today! My family and I have never been to any Disney on Ice shows before. This would definitely be an adventure for us.